Our case workers strive to meet all of the needs of a person or family, not just the need that brought them to our doors. The people we serve find themselves in need of our help due to a complex matrix of risk factors: less than adequate education, unemployment or underemployment, addiction, homelessness, extreme poverty or an unexpected crisis. We help them to get back on their feet over time. Food insecurity is a major threat to people experiencing poverty, particularly in urban areas. According to Project Bread, 11.4% of Massachusetts households, equating to approximately 700,000 children and adults, don’t know where their next meal is coming from. Our soup kitchens, shelters and after-school programs serve nutritious meals to those who might otherwise go hungry. Food pantries employ a choice model to allow beneficiaries to select items their family members eat, reducing waste. These critical programs aim to provide three full days’ worth of meals or more to each household they serve on a monthly basis. We confront natural disasters with acts of God. After a fire or a storm, our volunteer teams arrive on scene as quickly as possible to serve the immediate basic needs of survivors and first responders. Long after the smoke clears, our services continue until people’s lives are restored to normalcy. Poverty cripples a family when a crisis causes them to fall behind. Falling behind turns into debt. One debt turns into many and they can not climb out. Keeping families in their homes is far more effective than helping them recover once they become homeless. As we serve families over time, we naturally move beyond meeting basic needs. Using the resources we have, we strive to improve the lives of everyone who receives our services in the community. 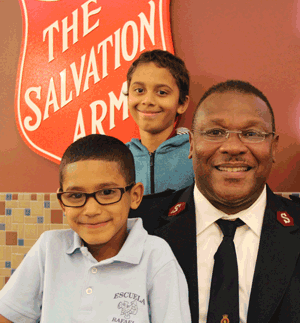 Remaining true to our mission, but constantly evolving our methods to remain relevant, The Salvation Army has developed a variety of strategies to address unmet needs in the communities we serve. For example, in Lowell, service to seniors is imperative. In Fall River, we see more need among children and youth, so an array of programs is offered for students. Character builds community. Our goal is to help children and adults attain a higher quality of life. Our troops programs instill character and help students to acquire lifelong skills. Instructional classes for adults develop confidence, productivity and self-sufficiency. We serve working poor and homeless families who could not afford traditional childcare fees. Single parents are able to maintain steady employment while children attend quality programs. This approach closes the achievement gap for young children experiencing poverty. Many aspects of Salvation Army worship and heritage involve music, especially brass bands. Local and statewide programs offer young people and adults the opportunity to play an instrument, broaden their artistic endeavors and form community in the unique way that the arts afford. A rapidly growing and often under-served population, elders find a welcoming place to gather, socialize and eat well-balanced meals at The Salvation Army. With visiting health clinics and other timely instructional seminars, seniors receive enrichment during their golden years. All children should go to camp. Many campers who attend Camp Wonderland experience the peace and safety of residential camping in the rural countryside for the first time. Students in our subsidized day camp programs have the opportunity to play a musical instrument, or to make crafts and play competitive games outside of school under the supervision of caring, well-trained staff. Our mission is not simply to feed the hungry over and over and over again. Our aim is to meet people’s needs in a way that transforms their lives to the point where they no longer need our services. Working closely with the families that seek our help, we look to find the root of their problems, not just what we can see on the surface. Many of the people who come to us for help at the holidays or to supplement their income from a low-wage job never expected to need help from The Salvation Army. An act of compassion at the right time can place a life or a family back on track. Parents who struggle to find quality employment often have to work more than one job to provide for their family’s basic needs. Frequently, there isn’t enough left over to afford costly care for their children after school. That’s where our programs come in—to provide a nurturing environment in which homework gets done, kids play and eat a nutritious dinner. Because our programs provide all this for little to no cost, parents can spend quality time at home before getting kids to bed on a school night. This innovative program serves court-involved and high-risk youth ages 12 to 17. Bridging the Gap provides the support and skills youth need to keep their lives on track. The twelve-unit life skills curriculum is offered to families at no cost. And it works. Within one year of completing the program, 87% of Bridging the Gap graduates do not re-offend. The key to escaping poverty is often the acquisition of new skills that improve a person’s prospects of being employed or promoted. Several programs address this need including Culinary Training at our Ray and Joan Kroc Corps Community Center in Dorchester, English for Speakers of Other Language (ESOL) classes in Roxbury and computer skills in several locations. 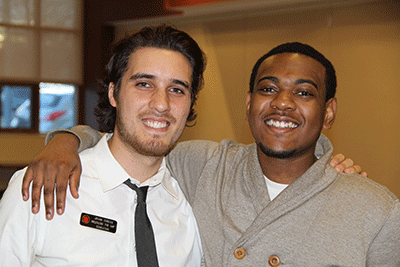 Strong community partnerships help program graduates to find meaningful employment. Our residential independent living program transforms the lives of homeless teen mothers and their children. We provide a safe home environment for the teens and their children, and a supportive group setting where they can develop their parenting skills. Girls from all over the state, as young as 13 years old, can participate in the program and they can stay at Gentle Arms until they are 20 and a half years old.